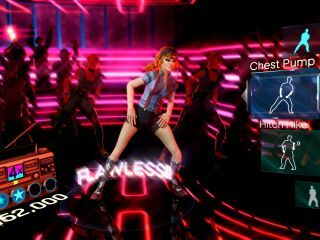 One of the slightly-overlooked new Kinect titles for Xbox 360 announced by Microsoft at E3 this week was Harmonix's Dance Central – a game that promises to teach you to dance. If, like most of us, you feel a bit uncomfortable dancing in your lounge in front of your peers, then Harmonix – they of Guitar Hero and (more recently) Rock Band fame – hope to help you shed your inhibitions. The mere fact that Harmonix has made this game has already got seasoned gamers interested in it. The gameplay seems simple, just follow the on-screen dancer through a series of moves to score points. Here are the first batch of screens to give you a taster of what's in store. Dance Central: So you think you can dance? Whether or not Harmonix can recreate the experiences (and success) that it made with the original Guitar Hero and Rock Band remains to be seen. On first glances, Dance Central looks very promising. Plus, you can also dance with multiple friends, should you so wish. Early feedback from those that have played it at E3 is very good indeed, so we actually look forward to playing a dance game for the first time in years!